It's not the places you go but the people you meet that make an experience - Not an official quote but that's exactly how I feel now that I've been to Barcelona! I know that I've totally skipped everything I wanted to blog about but while this is fresh in my mind, I just wanted to share it with you! In Barcelona, I ended up spending more time with my roommates (strangers in a hostel from London) than actually walking around and exploring everything. Maybe one day I will regret that, but at the moment, it seemed like it was the best decision I ever made! (Well, maybe I won't because I spent a whole day just walking around alone discovering new things before I met them so technically I got a taste of both!) Before I skip to the important part of this post, here are some google images of what I saw (since I have yet to upload my pictures and don't want to forget later). 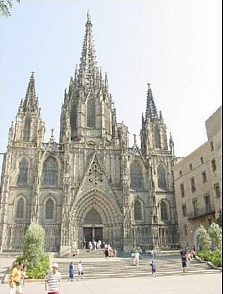 The cathedral that I stumbled upon on Day 1! There was an orchestra playing beautiful music...and about 100 old people dancing to it! Very relaxing environment - a great place to people watch. 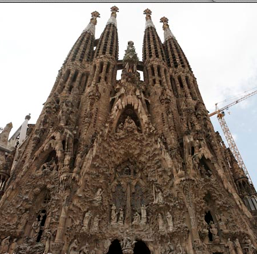 The work of Antoni Gaudi. So much to learn about him! Although he only built a part of this building (because he had no funds), it is still gorgeous because they are using his designs. Hopefully in the next 10 years they will finally finish building it and I can go back to see the finished product! If you're in Barcelona, definitely take a look inside because your contribution will go directly towards building it!! Anyway, I will spare you useless details but I would like to share some conversations I had with my roommates. I will put them in conversation form, labeling the roommates as A, B and C as to protect their privacy! To give a little bit of background information, A is a cardiologist, B is a physiologist and C is a recruiter for a pretty big firm. All of them are situated in London, love to travel when they get the time off and are very open to meeting new people and doing new things. My absolute favorite conversation with the cardiologist, who has many patients from the UK, other countries in Europe, America and Asia frequently. A: So want to hear a funny story from today? (This was an hour or so after I met my roommates.) We were on the bus and I wanted to ask someone how to get to the beach but none of us know how to say that in Spanish and can't say much else but "hola" (hi) and "habla ingles?" (do you speak in English). After looking around, I saw a lady without headphones and tapped her on the shoulder so I could see if she could help us out. I expected her to turn around smiling and thought she would want to help us out. Instead, she slowly turns her head and looks at us with disgust, fear and surprise. After looking at me for a few seconds, she slowly walked away from me and stood behind another person. I just stood there. I was so confused. I still don't really get it...it was the weirdest experience ever. Me: Well actually...haven't you noticed how people are just so different everywhere? For example, in certain places in India, it is not typical for someone to approach a woman. It's looked down upon, makes her look bad--even if she's not at fault, and makes her extremely uncomfortable. It's also not typical for a woman to approach others depending on where you are. A: Really? As a doctor, I'm always trying to learn about body language but the more I practice, the more I realize that it's almost impossible to know everything about everyone because there are just so many cultural differences. When I was a junior (which is equivalent to an American intern), I only dealt with people from the UK so it was easy treating every patient the same. They reacted similarly and I fell into an easy routine. Now that I have many international patients, I get so confused. Let me explain. So with someone from the UK, I can check them out and then say "I'll call you in 2-3 weeks if it's anything serious, otherwise you'll be fine" and they'll be happy and walk away. But the first time I had an American patient, she just kept asking me exactly what was wrong, what the medical terms were, what she could do until I gave more results, if I could call her regardless of the level of seriousness, etc. It took me by surprise and I had to walk out for a second to take a deep breath because I was definitely not used to it! No offense or anything but why are you Americans so detail-oriented?! Why can't you just relax and trust the doctor? Me: We're so used to knowing everything. I bet that she went home and Google-ed everything to make sure that you were accurate, and then even asked a few medical-field friends of hers to get their opinions as well. That's just the way we are! A: So can I ask you something that you don't have to answer? (Sure...) You are from India but you live in America. What does that make you? Does that make you the American lady in most aspects or the Indian lady in most aspects? You seem to actually connect to the Indian people...I'm Chinese but I was born and raised in the UK so I don't really associate myself with that culture. When asked, I state that I'm from London and that's it. ...so I don't want to bore you guys but to sum it up, we spent the next hour or two discussing different cultures and what we know about people. We talked about how important body language is, how much it can tell you and how much it varies in places. We also tried to figure out why it's so different in so many places. The cardiologist has been studying body language in different cultures for a few years now but even that hasn't helped much when it comes down to real life because there's just so much to accept and understand. After that first night, we would always take note of how people reacted to us (the American and Britishers), how they behaved in groups, who was the Alpha in the group, etc. It always added lots of flavor to our conversations. What's the point in sharing this with you? I'm not sure. 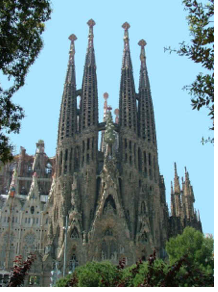 It was my favorite part of Barcelona and I just wanted to invite you to also think about this and learn more about it! Besides hanging out with my roommates in Barcelona and visiting those two major places, I didn't do much besides talk to strangers on the train or walk around and explore the city. Oh, no offense to absolutely anyone, but every single person we met that was born and raised in Spain did not like us...they refused to help us because they just didn't want to associate with us. On the other hand, every "outsider" that had been living there for 5, 10, 15 or even 20 years from Cuba, England, Argentina, Ecuador, etc. LOVED chatting with us in Spanish and English! I was always looking for ways to use my Spanish skills and I surprised myself when I realized how much I really knew. There were some people that told me about their families, why they're in Spain, how long they've been there, where they live, what they do, where they travel to, etc. in Spanish and I understood it all! Overall, we learned a lot about people and the way they are. I know that this one trip will enhance the rest of my stay in Europe because I will notice many details! I think it will also come into good use for when I'm back in the states!